I always thought that posts on other blogs that included a list of where that blogger wanted to go eat were a bit cheesy. But given the number of reviews I have to write for the survey these days, and given how it is easier to write them after visiting a restaurant, I found myself compiling such a list over the weekend. Of course I'm so busy with the survey that it didn't take long for me to realize that it's a simple way to update the site, and by listing the names of lots of different restaurants, a good way to attract additional hits to your site. So forgive me if I get a little cheesy here but, here is a list of the 100 places I would like to eat at in 2008. I'm sure some of you ware going to be surprised by some of the choices. Especially places that serve traditional French cuisine which anyone who reads this site knows, often makes me feel like I am drowning in a sea of veal demi-glace. So I feel it is important to explain myself. I like to think of myself as a dining martyr. Someone who will take consume gallons of gooey, over-reduced and over-salted stocks in order to take one for the team so to speak. But also, there is some benefit to sampling styles of cuisine that have become passe which is to understand what it was that made a chef important at the height of their culinary powers. And on occasion I come across a chef who has lightened his cuisine and is turning out some top-notch food. Witness my review of L'Auberge D'Ill below. So without further delay, here is my list of 100 Restaurants I Would Like to Eat at in 2008. Of course if you happen to have been at any of the restaurants on this list, click the link at the bottom of the page and rate them for the survey. Le Champignon Sauvage - Cheltenham, U.K. MOST OVERRATED RESTAURANTS 2008 NOW ONLINE!!! Wise, witty, snippy and snarky - no I'm not talking about The Colbert Report - I'm talking about the Opinionated About Dining Most Overrated Restaurants of 2008. Click on the link below to read the ten most overrated in the following regions: New York City; United States; United Kingdom and Europe. You can also now read the 100 Best Restaurants in North America & Europe online using our new cool and groovy flip-book technology. Just click on the link below and wait for the cover to loads. Then just click the top right corner to begin turning the pages. Happy reading and don't forget to rate as many restaurants as you can! The results of our 2008 Fine Dining Survey have now been published. Over 900 people participated in the survey, with 25% of them being located outside of the U.S. The ratings are broken down into categories which correlate to how important a restaurant is. I just hung up the phone with DHL at Heathrow and the books are being delivered in the morning and they should be in various London shops by Monday or Tuesday. Also, it's not too late to get a free copy. Just click on the link for the homepage and register. 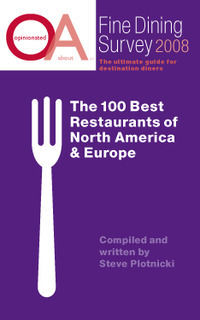 As soon as you begin rating restaurants, our London office will put a copy of the guide in the mail to you. If you participated in the survey, a copy will be mailed to you shortly. If you would like a free copy, you can get one by filling out our survey. Just click on the link to our homepage to register for the 2009 survey. If you would like to purchase copies, you can do so on the home page by using a PayPal account. Thanks to everyone who helped make this happen. This is just the beginning. I am planning to expand the scope of the survey for 2009 to include moderate and inexpensive dining with the goal of publishing comprehensive guides to dining for bothe continents in the coming 12 months.